Talk of a new regional force is unrealistic. There is only one way to keep the peace after 2014. As NATO-led coalition forces prepare to withdraw from Afghanistan, we are increasingly hearing the idea that a multinational regional security force (MN-RSF) would be a viable option for Afghanistan. The reality on the ground, however, suggests otherwise. In short, the deployment of an MN-RSF is simply not feasible. To begin with, China is unlikely to change its policy of non-intervention anytime soon. Nor does it want to get involved in a war of attrition at a time when it is seeking to modernize its security forces for a larger possible showdown in the Pacific. Next, the deployment of troops to Afghanistan by Pakistan and Iran would be highly sensitive, even if it were made within the framework of an MN-RSC. Both countries and the international community acknowledge this, which is why at the Bonn Conference in 2001, Iran and Pakistan’s names were kept off the table when the idea of a U.N.-led multinational security force was discussed. Not only does that perception of Iran and Pakistan persist, but with the growing Pakistan and Iran interference in Afghanistan’s affairs, Afghans are becoming ever more sensitive towards these countries. In fact, the logic behind the endorsement of the Bilateral Security Agreement (BSA) by Afghanistan’s Loya Jirga was curbing Iranian and Pakistani influence in Afghanistan—let alone allowing them to deploy troops. Afghanistan’s Pashtuns are already accusing Iran of stirring linguistic and cultural tensions, which makes it more than difficult for Iran to put boots on the ground. India, meanwhile, is not interested in getting involved on the battlefields of Afghanistan. Any Indian involvement would provoke Pakistan, which in turn would further destabilize the entire region. Pakistan’s Inter-Services Intelligence (ISI) has already bombed the Indian Embassy in Kabul in response to India’s growing presence in Afghanistan. New Delhi itself acknowledges the ramifications of provoking Pakistan, and has to date rebuffed President Hamid Karzai’s requests that India sell heavy weapons to Afghanistan. An MN-RSF involving the five Central Asian countries (CAR) seems very unlikely for several reasons. First, the CAR themselves have faced threats of extremism since the fall of the Soviet Union. They are in no position to get involved in Afghanistan, which might further provoke extremists into striking at their countries directly. Second, a significant element of the military in today’s CAR fought in Afghanistan in the 1980s. Neither commanders nor politicians in these countries want to repeat the experience. Third, given their weapons and techniques, which resemble those of the former Soviet Union, troops from the CAR would likely encounter even more ferocious resistance from the insurgents. They could even provoke the general public. Fourth, the CAR have at any rate evinced no interest in joining a multi-national force at any point in the last 12 years. 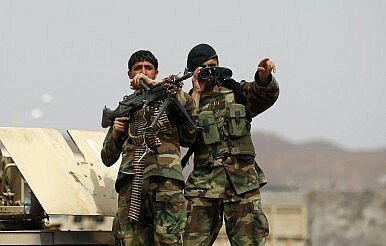 Fifth and finally, the ethnic component of CAR troops could also be unwelcome in Afghanistan. For instance, Tajik troops may be viewed as having been deployed to help their fellow Tajiks in Afghanistan. The same could be true for Uzbek and Turkmen soldiers. These forces would be met by a much fiercer response from the Pashtun-dominated Taliban. In fact the Taliban might seek to instigate Pashtun nationalism to stand against forces who have come—in the eyes of the Taliban—from Central Asia to partition Afghanistan. Pashtuns for their part may go further and target Afghan Tajiks, Uzbeks, and Turkmen. In that scenario, it is not hard to envisage all-out civil war in Afghanistan. Other countries in the region that could conceivably contribute troops are the Muslim countries from the Middle East: Saudi Arabia, the U.A.E. and Egypt, for instance. Yet these countries are very unlikely to join any MN-RSF in Afghanistan because their public sympathizes with the Afghan insurgents. Middle Eastern countries would not want to gamble on sending troops to Afghanistan. Particularly at a time when they still trying to get past the Arab Spring, fighting insurgents with whom their publics sympathize would be tremendously unappetizing. Turkey, Azerbaijan and Jordan already have troops in Afghanistan. Their continued presence post-2014 will be very much dependent on the United States. If the U.S. pulls out completely, so will these countries. Thus, the very idea of an MN-RSF is not only unwelcome in Afghanistan, it is effectively impossible. With the infeasibility of an MN-RSF, Afghanistan should ink the BSA with the U.S. with haste sufficient to allow the U.S. to maintain a presence beyond the end of this year. In addition to training and supporting the Afghan National Security Forces (ANSF), U.S. troops would also boost morale, enabling the ANSF to independently carry out combat operations. On April 5—Election Day—the ANSF showed that they had the ability to maintain stability. Nonetheless, their capabilities still need to be strengthened further. In so doing, special attention should be paid to two items. First, the training of special forces to storm buildings and other complexes if they are taken by insurgents. Over the last month, ANSF have stormed several buildings soon after they had been taken by insurgents. Special forces should be able to be deployed to any part of the country within hours if necessary to overtake insurgents. Second, the Afghan Air Force should acquire more transport aircraft and bombers sooner rather than later. Afghanistan not only has mountainous terrain, most parts of the country also lack paved roads and railroads. As a result, troop deployments and rapid-response operations quickly tend to run into trouble. To overcome this, the ANSF—especially the special forces—should be able to be swiftly moved to any part of the country by air. Moreover, bombers would prove helpful in pounding insurgents’ positions before ground troops can clear the area. Ultimately, the only way to genuine and sustainable peace in Afghanistan is to strengthen ANSF. The only realistic role of foreign forces is to serve as a catalyst for this. Arwin Rahi is a Fulbright fellow at Texas A&M University’s George Bush School of Government and Public Service. He was an adviser to the Parwan Governor from 2012 to 2013. Worried about the NATO withdrawal, Russia has adopted several new policies for Central Asia. India’s Controversial Afghanistan DamsAfghanistan Struggles to Contain the TalibanAfghanistan at the CrossroadsAfghans Ponder the End of ISAFWhat Now for Afghanistan?